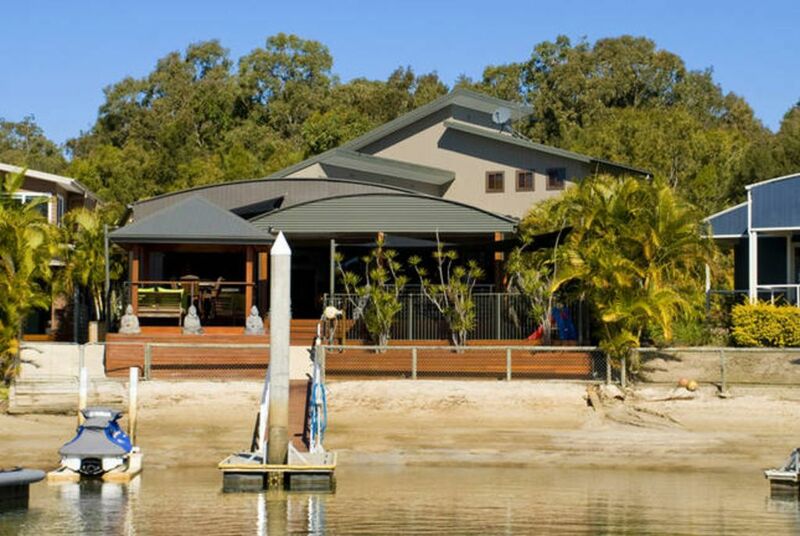 This Waterfront North facing 5 bedroom, 3 bathroom island home has everything you will desire in a luxury style accommodation. This stunning waterfront home overlooking your own sandy beach with bali hut will have you relaxing the moment you arrive, and only a 10 minute boat trip from Runaway Bay. The Islander can easily accommodate a number of families with the ground floor accessing 4 bedrooms, living and dining, and 1 huge bedroom, rumpus and tv room upstairs. Your fully self contained kitchen has 2 dishwashers, modern appliances, and a servery to the outdoors. - 3 Bathrooms, 2 downstairs, 1 upstairs. The Islander has the feel of being on holiday with the comforts and convenience of home. Your holiday at The Islander Retreat, will allow you to get away from the hustle and bustle of the city, and all the stress that comes with it. We have set up our Island Retreat to cater for families and friends young and old. The perfect place to make life long memories. You will have access to the nature walks throughout the island with an abundance of wallabies and wildlife, the canals and waterways for a spot of fishing or kayaking, your own sandy beach, curl up with a book on the daybed under the bali hut, or take a plunge in our own private pool. If cooking up a BBQ feast on our huge outdoor deck is not for you, a short bike ride or boat trip to the neighbouring resort offers excellent dining choices. Alternatively a 5 minute boat trip allows you to enjoy dining and refreshments at Tipplers Café. Come and enjoy our home away from home! This home is just amazing !!! with such calm and relaxing vibe as soon as you walk in. There is nothing you need to take with you except your beach towels and fishing rods . Perfect place for the whole family the owners have put so much thought in providing everything you could need for a stress free break. Already planning for when we can free up some time for our next stay here. Thank you for your review, and for taking care of our property. We are glad you liked South Stradbroke Island as much as we do! Hope you may consider staying again. We are thrilled you enjoyed your stay. Thank you for looking after property like you would your own. We hope you might consider our property for another holiday. Thank you for looking after our property like you own. We hope you may consider a stay with us again in the future. Everything and more for our family of 13. Will return for sure! We are thrilled you enjoyed your stay, and hope to see you back at The Islander Retreat again. We had such a great weekend at the Islander Retreat! What a beautiful house. We had 5 couples staying here and never felt like we were in each others pockets. Awesome outdoor area where we spent most of our time. Suitable for hot and cold climates with the air conditioning and pool for hotter days and gas heaters for cooler nights. The basketball hoop and cruiser bikes got a workout over our weekend as well. It was really lovely how the owners of the house have gone the extra mile to make sure there are plenty of things to do, including a full games cupboard. The welcome treats were definitely enjoyed as well. Will definitely consider staying here again!